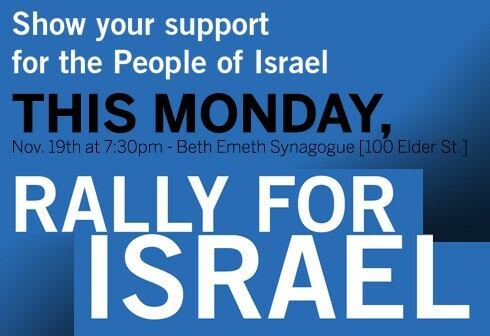 By Daniel Horowitz--Join thousands of Torontonians and demonstrate your solidarity with the people of Israel by attending tonight’s Rally for the People of Israel, being held at Toronto’s Beth Emeth Bais Yehuda Synagogue (100 Elder Street) starting at 7:30 p.m. The rally will feature a keynote address by author and CNN contributor, journalist David Frum, while The Honorable James Moore, Minister of Canadian Heritage and Official Languages, will be on hand to deliver remarks on behalf of the Government of Canada. The rally, which will also be broadcast live to three satellite locations: The Schwartz/Reisman Centre on UJA Federation’s Lebovic Campus in Vaughan, The Wolfond Centre for Jewish Campus Life on Harbord Street, and Wallenberg CHAT on Wilmington Avenue, is organized by UJA Federation of Greater Toronto in partnership with The Centre for Israel and Jewish Affairs. The event will also include first-hand reports from the confrontation zone, describing the current situation in Southern Israel and what tomorrow may hold.